Nevertheless, vampires are eternally appealing movie creatures. Why is that, Keith and Tasha, and why are we seeing such a heavy influx of vampire movies now? Keith: I think one reason vampires refuse to go away is that the vampire myth is so malleable, and has such broad applications. I thought we’d reached peak vampire a few years back, and I wasn’t alone. I vaguely remember Rolling Stone declaring werewolves the hot monster for the 2010s. That didn’t happen, and while it’s tempting to lay the blame on the not-so-greatness of movies like Blood And Chocolate and The Wolfman, there’s just more to be done with vampires. If you need a metaphor for addiction, or corruption, or you just want to use vampires as a shorthand for romantic outcasts, that works. Their uncanny resemblance (emphasis on uncanny) to humans makes them that much more effective. As to the question of why now, my only answer is “Why not now?” But maybe Tasha has a better one. Tasha: Well, define “now.” Are we really seeing an unusual number of vampire movies now, compared to, say, the blitz of zombie-related stories of the past several years? The vampire wave doesn’t seem as prominent or notable to me as the zombie run, but maybe that’s because I see a lot of the recent vampire movies as stemming from different causes: Vampire Academy probably has more to do with the rash of YA book-to-film adaptations than with an uptick in bloodsucker stories. Dark Shadows is part of the never-ending attempt to resurrect old TV properties with some name recognition. Abraham Lincoln: Vampire Hunter is part of the literary/horror mashup trend and is a pretty standard supernatural-action movie. Hotel Transylvania is the usual CGI movie with a big, colorful cast and a lot of goofy action. Underworld: Awakening is just continuing a successful, profitable action-movie franchise, and so on. The only really recent film besides Only Lovers Left Alive that really feels to me like it’s about vampires—as opposed to “about generic action sequences” or “about family, but with some vampires,” or whatever—is Neil Jordan’s Byzantium. Most of the rest use vampires more as a trope than a subject. Don’t get me wrong, I think there are good reasons for a vampire resurgence: The Twilight movies collectively made around $3 billion worldwide, True Blood is heading to a wrap-up, but had a sleazy, successful seven-year run, and The Vampire Diaries has been a hit for the CW. And with zombies on the wane, something had to take over. But there’s a lack of uniformity of ideas, direction, or approach to all these vamp films that makes it hard for me to see them as a movement. That’s because Keith is right: One of the big reasons vampires persist is because they’re so conceptually flexible—there are enough different vampire myths that creators can pick and chose, and use them to cover a lot of the symbolic or story ground that makes other monsters unique. Vampires can come in generic, constantly growing hordes like zombies, with all the horror of something that looks human, but is dead and impervious to pain. They can look like people but hide bestial, uncontrollable natures, like werewolves. They can be helpless, lonely, powerful, eternal outcasts who can’t fit in with humanity, like Frankenstein’s monster. They can change shape, they can convert beloved friends and relatives into monstrous strangers, they can transcend human limits like wounds or age—a lot of the things that make movie aliens seem alien. They can be strong, fast, hard-to-fight murderers to rival any horror-movie mad slasher. They’re the Swiss Army knife of monsters. What’s not to like? In fact, I put this to you as a challenge: Is there any horror-movie idea that vampires aren’t really suitable for? Scott: I wouldn’t want to see a found-footage vampire movie, and there are certainly plenty of horror movies that don’t gain from having a supernatural element, but I get what you both are saying about the malleability of the creature. What appeals to me most, generally speaking, about vampires in horror movies is that they require filmmakers to step up to the plate stylistically. They’re associated with darkness and passion, with ornate physical and emotional architecture, and with the color red, and directors have to honor that tradition by using the medium as expressively as they can. Hence my affection for Bram Stoker’s Dracula, a Francis Ford Coppola film that’s badly flawed in many ways—the performances especially—but extraordinary in its go-for-broke technique, which pays homage to the earliest vampire films with in-camera effects and matte paintings while still being on the cutting edge. It does exactly what the Argento Dracula failed to do: Made the classic seem modern. I’m glad you mentioned Byzantium, too, Tasha, because the more distance I’ve gotten from my initial ho-hum reaction, the more I’ve come to appreciate the atmosphere Jordan brings to the table. Jordan seemed to want a do-over after his Interview With A Vampire—or at least a purer, less commercially obligated take on the genre—and his setting, a permanently off-season coastal town, is more vivid in my mind than anything that happens within it. 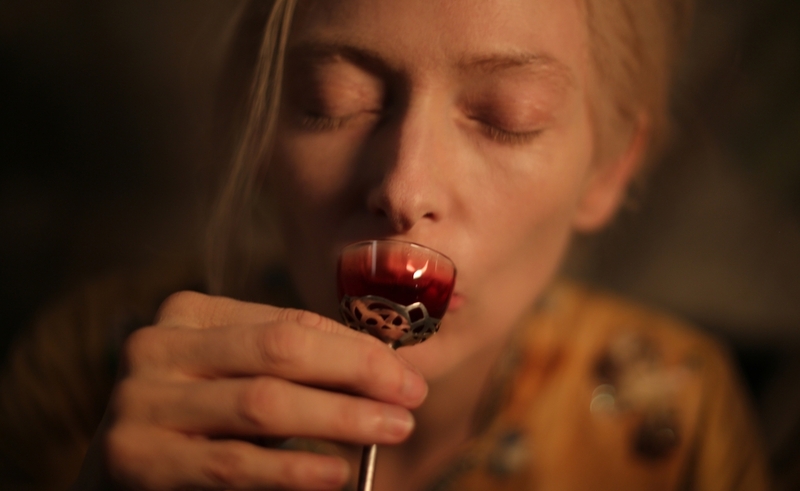 A movie like Only Lovers Left Alive is clever in the way it subverts the conventions of the genre, but there’s something to be said for filmmakers who use vampire tales as a jumping-off point for exercises in style and ambience. It’s a prime example of Roger Ebert’s edict that it doesn’t matter what a movie does, but how it does it. Keith: You know what I’d love to see, though? A film like Kathryn Bigelow’s Near Dark that upends every expectation I have about vampires. In that film, vampires are violent, criminal fringe-dwellers without a trace of Old World romanticism. Near Dark has been much-imitated in the years since its 1987 release—we wouldn’t have Buffy The Vampire Slayer’s Spike without it, for starters—so I wouldn’t want that movie again, so much as one that had a take on vampires that’s as fresh and unexpected. What would that be? Where would it come from? Don’t ask me. I just watch ’em. That said, if anyone’s made a film that’s dealt with how vampires have adjusted to the way technology has changed our social lives, I’d yet to see it. I’ll throw out one free idea: Grindr, but for vampires. Getting into vampire films that do something different… the last one that really surprised me was Thirst, co-written and directed by Oldboy’s Park Chan-wook. There are some standard-issue vampire ideas in that—blood, sensuality, immortality, moral compromise—but Park gets at some of the more interesting things about vampire stories by looking at two people with extremely different reactions to vampirism, and by coming up with an unusual way of contracting the condition in the first place. Mostly, though, I’m sold on Thirst’s perfect ending, one of the best and most surprising treatments of vampires I’ve seen on film. To no one’s surprise, 1983’s The Hunger is an old favorite—it looks garish and stark these days, like a Robert Palmer video, but it captures the idea of the sensual vampire life like no other movie I’ve seen, and has the benefit of not revolving around a vampire hunter, a trope I’m much more weary with than vampires themselves. And I’d be doing my teen self a disservice if I didn’t acknowledge my long-held love of 1987’s The Lost Boys, especially the soundtrack. When it comes to really off-the-beaten-path favorites, though, you can’t beat the animated 1986 oddity Vampires In Havana, a surreal, sloppy, silly Cuban horror-comedy about a bunch of American and European vampires fighting over exclusive control of Vampisol, a treatment that makes vampires immune to sunlight. Here’s an unpopular opinion for you, though—I’d actually rank the Twilight movies among my all-time favorite films about vampires, if they weren’t so deeply and soppily devoted to wish-fulfillment fantasies about their world’s least interesting character. I hate the dreary plots and endless dull love-triangling, but there’s a lot of intrigue in the basic way the films present the Cullens’ found family of creepy, pallid, dead-eyed, superpowered bloodsuckers, especially the younger-looking ones who have to wearily trudge through high school over and over throughout the decades, because of their apparent age. If Stephenie Meyer ever gets short on cash and writes about the Cullens’ pre-Bella years, I’d see that film adaptation with some interest. Scott: Why do you need to watch the Twilight movies when Near Dark exists, Tasha? That has both ends covered: There’s a moody, affecting, emotional love story at the center of a hyper-violent, rip-snorting, Western-style bloodbath. What I appreciate most about that one is how Kathryn Bigelow takes the vampire movie away from its high-toned, castle-bound, European roots and turns it into a redneck action movie that nonetheless has a romantic pull. In its love story, the film is aware that eternal love means eternal damnation, too, so when a vampire turns a human she loves, she understands it’s a selfish act that condemns him to wander the earth indefinitely. Near Dark is also part of that subset of vampire movies—George Romero’s Martin foremost among them, but I saw it again recently in the 1979 Ozsploitation picture Thirst—in which blood is not extracted by fangs, but by other means, which leads to a justly famous barroom dust-up where a clan feasts messily on the patrons. And while we’re talking modern, revisionist examples of the genre, let me put in a word for two comedies: Amy Heckerling’s Vamps, which reunited her with Clueless star Alicia Silverstone after 17 years, and was barely released to theaters before shuffling off to instant obscurity, but it’s a fine showcase for Heckerling’s Borscht Belt one-liners and the buoyant chemistry between Silverstone and her vastly talented co-star, Krysten Ritter. (A typical one-liner: When a vamp master played by Sigourney Weaver turns up among a sea of dead diners at a Chinese restaurant, she shrugs and says, “You know how it is when you eat Chinese. Half an hour later, you’re hungry again.”) I’m also fond of the Hong Kong action-comedy Mr. Vampire from 1985, if only for the never-not-funny spectacle of the “hopping vampire,” which is exactly what it sounds like, only blind and with excellent martial-arts skills. How about you, Keith? Any off the wall vampire fare that you like? Keith: You beat me to the Mr. Vampire punch, there, Scott. I love those hopping vampires. If there’s another type of vampire I’d like to see more of, though, it would be the exact opposite of the modern, tech-savvy vampire I proposed above. (And, Tasha, I love the Casual Encounters detail. Maybe we should work on a pitch together. We’ll call it Vampires 2.0, and fill it with all kinds of modern details, and it’ll be dated before it even comes out, and probably turn out awful. Cool?) The first big-screen vampire—Nosferatu—is also one of the best, in part because Max Schreck plays him as a monster who can’t hide his monstrousness. Klaus Kinski was good in the part, too, in Werner Herzog’s remake, but this isn’t a type of vampire you see that often, one who’s barely able, or completely unable, to pass as human. Tasha: Maybe that’s because vampires’ humanity is what makes them relatable and interesting to us. As creepy and terrifying as Max Schreck is, he’s grotesque and pathetic, too, because he’s so far gone into his condition that he seems more like a scurrying bipedal rat than a person. The stretchy-mouthed, CGI-aided vampires of Van Helsing are pretty laughable. Your exaggeratedly inhuman vampires—Bunnicula, the Count on Sesame Street, Fang from Vampire Dog—tend to be comic or cuddly. But humanoid vampires can be unsettling or monstrous, creepy or romantic. And maybe that’s because that flexibility—that sense that storytellers can pick and choose among different myths, symbols, and degrees of power and control to tell the specific stories they want to tell—extends to the audience as well. There’s a near-universal appeal in the idea of being beautiful, eternal, and just a little outside humanity, free to decide whether to be part of it or not. The more human the vampire, the more wish-fulfillment elements creep in, as viewers can map in their own desires for power, beauty, isolation, or inclusion over the fangy bastards. Try doing that with a zombie.